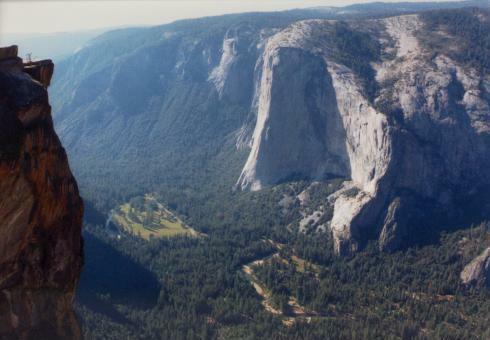 In September 1993, I took a five-day trip to Yosemite, by myself. I did a lot of hiking and thinking, and was literally overwhelmed more than once by the incredible scale of the place. There’s a lot of mystical energy and beauty up there. Here are some of the pictures I took. They’re each about 40K. They look much better if you can browse with more than 256 colors. 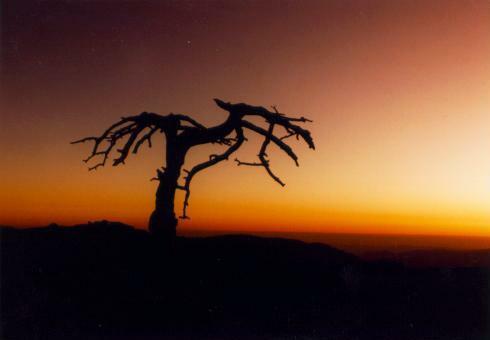 An old tree on top of Sentinel Dome, one of the highest points in the Yosemite Valley area. This was looking off towards where the sun had just set. The sky was a lot more evenly colored than it looks in this picture. Immediately after taking this I started hiking down the mountain, and got lost in the woods! Took me about forty minutes of panicked scrambling through bushes and up hillsides to reach an actual path, and the coyotes howling didn’t help matters any. A picture looking north from the south valley rim towards El Capitan, one of the astonishing rock formations in the valley. A glacier scooped the rock away as it carved its path eastwards. 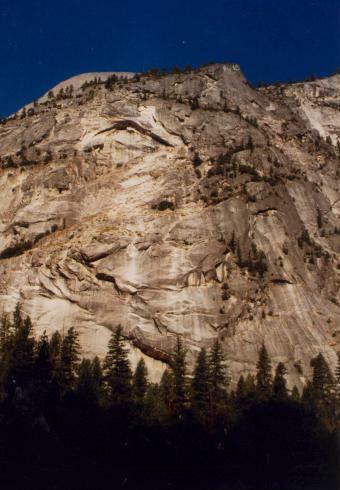 People climb up that rockface–almost 4,000 feet. Unbelievable. 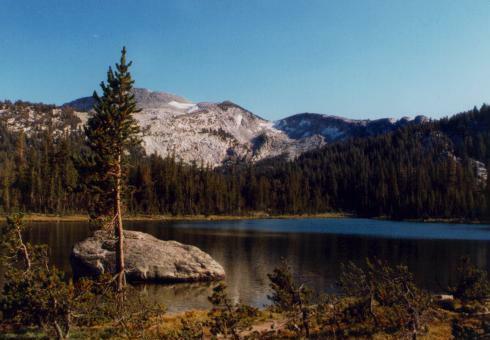 This little lake is nestled in the moutains above the Tuolumne Meadows campground. Real bear territory up here. Yes, it’s September, and that snow up on the hills is left over from last year… it’s chilly up here around 6,000 feet. There was marsh all around the rim of the lake, and in some spots you could sink right in. Now we abruptly shift camera orientation. This is a shot of (what else?) 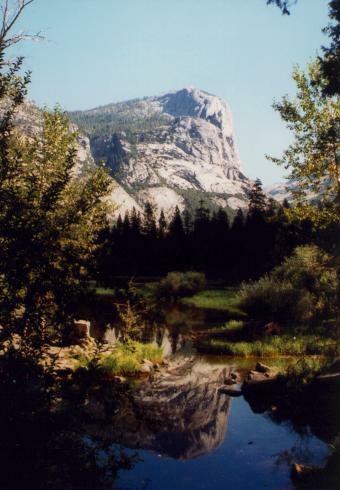 Mirror Lake. The lake is slowly shrinking as the remains of the forest fill it up. Enjoy the world now, today, this moment; it’s always changing and there is beauty all around. I can’t remember exactly where in the valley I was for this shot. Can you see the fiercely grinning mountain man etched in the rock? Snaggle-toothed and squinty-eyed, lurking and gleeful? Some folks see him, others don’t. 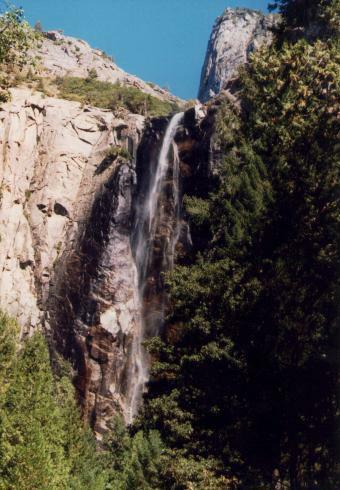 A shot of Bridalveil Falls, living up to its name, barely alive after a summer of drought. The plants around its rim are still loving life, though, green and flourishing. The air under a waterfall is unlike any other air… it’s carried briskly down and washed through and through, and it flows over you in a moist current. A couple of waterfall hikes I’ve been on included interludes of just breathing the air river of the waterfall.